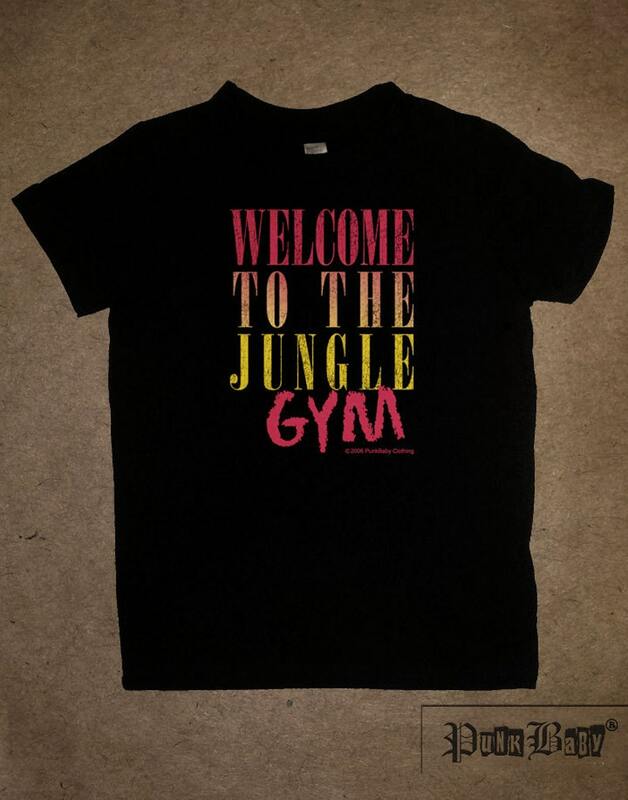 "Welcome to the Jungle Gym" black tee, for wee ones with more style than the average tot! - Tee is a loose fit. 4T may work for a larger 2-year-old and will also work for 3-year-olds! Our teensy styles are all hand printed on American made goods, in Los Angeles, with original Punk Baby® designs. Shipping: 2-3 items (depending on size) will cost the same to ship within the US and internationally. For international shipments, please allow more time to ship and to calculate shipping. Punk Baby Logo, hand screen printed, black cotton hoodie with plaid patch, for mini punks, pirates, or just plain precious kids! I wish the shirt was made of better, softer cotton. My friend cried she loves it! I think my goddaughter will rock this!!! Thank you!!! My Moms Rock hand screen printed, pink, cotton infant onesie for babies who love their mommies! If the incorrect item is shipped (which has never happened yet!) I'll refund all shipping and item costs. If you receive your Punk Baby order and choose to return it due to personal preference, please ship the item within 7 days of receipt with tags on, unused and in the original condition. I will fully refund the original cost of the item and any taxes once the item has arrived in the original condition. However, shipping either way can not be reimbursed. Punk Baby is not liable for mishandling of the product, including improper washing, normal wear and tear, etc. If you have any questions about the product, please message me. -Domestic shipments using First Class Mail can take between 1-4 days, depending on the distance from Los Angeles. -Need your order in a hurry? Choose Priority Mail shipping for your order and it will arrive in 2-3 days. Express is overnight and a LOT more expensive. If you are in California or on the West Coast, know that first class mail will typically arrive in a couple days, although I (but mainly the post office) doesn't guarantee it. -International shipments are a little tricky via US Postal service since first class and Priority Mail can NOT be tracked. Since beginning the business in 2006 I've only had one reported 'missing' international shipment. Please note that orders that go missing due to mishandling by the postal service is not the responsibility of Punk Baby and we can therefore not replace orders that may go missing despite tracking. Unfortunately as a tiny business it's necessary to mention this. Domestic shipments, however, are always tracked via USPS!